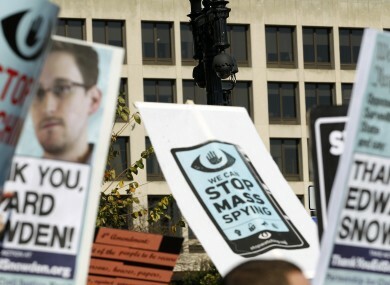 A rally in Washington to protest against the National Security Agency's spying on Americans, and to demand action from Congress on the NSA's mass surveillance programs. FACED WITH A flood of revelations about US spying practices, the White House is considering ending its eavesdropping on friendly foreign leaders, a senior administration official said. Yesterday, Senator Dianne Feinstein, chairwoman of the Senate Intelligence Committee, called for a “total review of all intelligence programs” following the Merkel allegations. In a statement, the California Democrat said the White House had informed her that “collection on our allies will not continue”. “With respect to NSA collection of intelligence on leaders of US allies — including France, Spain, Mexico and Germany — let me state unequivocally: I am totally opposed,” Feinstein said. She added that the US should not be “collecting phone calls or emails of friendly presidents and prime ministers” unless in an emergency with approval of the president. In response to the revelations, German officials said Monday that the US could lose access to an important law enforcement tool used to track terrorist money flows. Other longtime allies have also expressed their displeasure about the US spying on their leaders. As possible leverage, German authorities cited last week’s non-binding resolution by the European Parliament to suspend a post-9/11 agreement allowing the Americans access to bank transfer data to track the flow of terrorist money. A top German official said Monday she believed the Americans were using the information to gather economic intelligence apart from terrorism and said the agreement, known as the SWIFT agreement, should be suspended. European Union officials who are in Washington to meet with lawmakers ahead of White House talks said US surveillance of their people could affect negotiations over a US-Europe trade agreement. They said European privacy must be better protected. Many officials in Germany and other European governments have made clear, however, that they don’t favor suspending the US-EU trade talks which began last summer because both sides stand to gain so much through the proposed deal, especially against competition from China and other emerging markets. As tensions with European allies escalate, the top US intelligence official declassified dozens of pages of top-secret documents in an apparent bid to show the NSA was acting legally when it gathered millions of Americans’ phone records. Director of National Intelligence James R. Clapper said he was following the president’s direction to make public as much information as possible about how US intelligence agencies spy under the Foreign Intelligence Surveillance Act. Monday’s release of documents focused on Section 215 of the Patriot Act, which allows the bulk collection of US phone records. Still, he acknowledged the tensions with allies over the eavesdropping disclosures and said the White House was “working to allay those concerns,” though he refused to discuss any specific reports or provide details of internal White House discussions. Email “A 'total review' on US surveillance operations ordered ”. Feedback on “A 'total review' on US surveillance operations ordered ”.